Before attempting to replace a light bulb, be sure the switch is turned to the "OFF" position. The next paragraph shows how to reach the light bulbs so they may be changed. Be sure to replace the burned-out bulb with one of the same number and wattage rating. 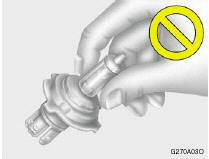 o Keep the lamps out of contact with petroleum products, such as oil, gasoline, etc. 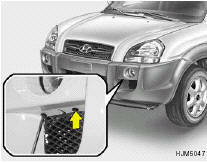 o After heavy, driving rain or washing, headlight and taillight lenses could appear frosty. This condition is caused by the temperature difference between the lamp inside and outside. This is similar to the condensation on your windows inside your vehicle during the rain and doesn’t indicate a problem with your vehicle. 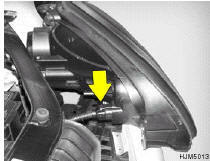 If the water leaks into the lamp bulb circuitry, have the vehicle checked by an Authorized Hyundai Dealer. 1. Allow the bulb to cool. Wear eye protection. 3. 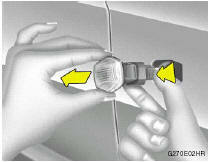 Always grasp the bulb by its plastic base, avoid touching the glass. 8. 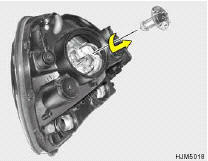 Push the bulb spring to remove the headlight bulb. 9. 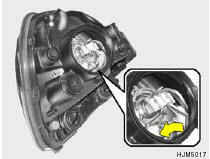 Remove the protective cap from the replacement bulb and install the new bulb by matching the plastic base with the headlight hole. Reattach the bulb spring and reconnect the connector. 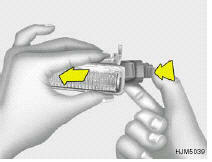 10.Use the protective cap and carton to promptly dispose of the old bulb. 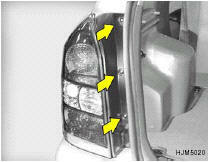 11.Check for proper headlight aim. 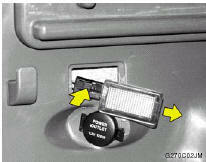 12.To replace the front turn signal light bulb, remove from the bulb holder and install the new bulb. Do not touch the glass of the new bulb. This halogen bulb contains gas under pressure and if impacted could shatter, resulting in flying fragments. Always wear eye protection when servicing the bulb. Protect the bulb against abrasions or scratches and against liquids when lighted. 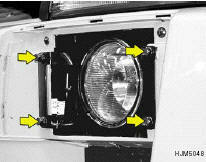 Turn the bulb on only when installing in a headlight. 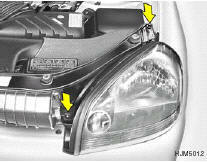 Replace the headlight if damaged or cracked. Keep the bulb out of the reach of children and dispose of the used bulb with care. 2. 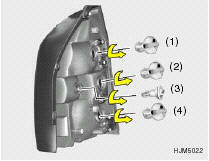 Remove the mounting screws as shown with a phillips screwdriver. 3. 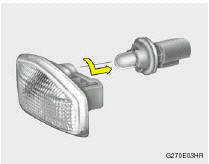 To replace the rear combination light (stop/ tail light, turn signal light, back-up light, side mark light), take it out from the bulb holder by turning it counterclockwise. 4. Install the new bulb. 1. 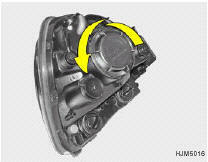 Remove the cover with a phillips screw driver. 2. Remove the bolts with a wrench. 2. Remove the cover with a flat blade screwdriver. 4. 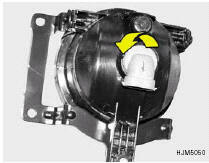 Replace with a new bulb.